Our E3 2010 Party Is Tonight! Today's the day, party hounds. Kotaku is throwing its annual pre-E3 shindig in downtown LA and here are the details on the when, the where and the how old you have to be. Our brand new location this year is the lovely Broadway Bar in downtown Los Angeles. The festivities, which include boozing and schmoozing, begin at 9 p.m. on Sunday, June 13. The drinks are on us until the tab runs out. Yes, drinks. The close proximity to alcohol means this is a 21+ event, so age quickly! No RSVP is necessary, just show up—and show up early! 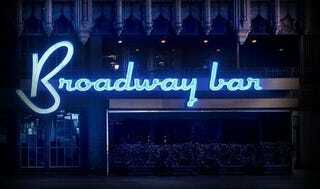 Broadway Bar is located at 830 South Broadway, Los Angeles, CA 90014. See you there?